Resource Publications (CA), 9781532663734, 170pp. After four years of college and six years in seminary, William Mills was ready for a parish--or so he thought. He didn't realize much of his time would be endless discussions about bagels and coffee, digging ditches, and parking lot condom patrols. For six years, community life was just humming along. Then disaster struck. Mills' life came crashing down when nearly a third of his congregation left in a public power play, causing him to question his faith in himself, in the church, and in God. Marva Dawn, a noted writer of spirituality and ministry, said that being a pastor is like being peppered with popcorn: after a while, you just get tired of it, pack your bags, and move on. However, as Mills himself says, ""I was either too stubborn or stupid, so I stayed."" 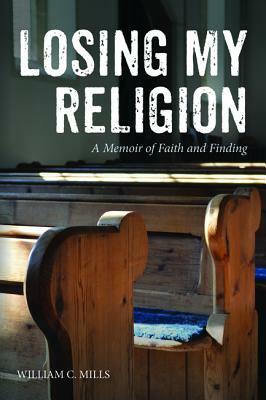 Losing My Religion is about the ups and downs, ins and outs, choices and challenges of being a pastor in the twenty-first-century church. It's also about the redemptive power of community life and finding healing and wholeness in a broken world. ""William Mills has given us a true story told truthfully, a story of a faith lost and found, a story of the church at its best and worst, a story of a priest who persisted in his vocation in spite of everything. Service to the Body of Christ, the church, is not for the faint of heart and yet, in the end, there are blessings."" --Will Willimon, United Methodist Bishop, retired, and Professor of the Practice of Christian Ministry, Duke Divinity School; author, Who Lynched Willie Earle? Preaching to Confront Racism. ""William Mills has gone honest and intimate with us in telling his story of the travail of ministry. His drama of mean-spirited betrayal in the congregation and the late unexpected reassurance of support replicates our best story of crucifixion and resurrection."" --Walter Brueggemann, Columbia Theological Seminary ""William Mills' memoir is a beautifully crafted, honest, wise, and insightful book. It stands in the very best tradition of spirituality--a writer and text that can speak to the real condition of the soul, and the day-to-day struggle that many have with belief. . . Honest and wise books on religious resilience are often hard to find. But this is one of those rare gems, and I commend it for anyone who knows how long our spiritual journey can be."" --Martyn Percy, Dean of Christ Church, Oxford ""The Church speaks a lot about truth but isn't so good at honesty. Here is a priest who has learned the cost of this and who, with courage and imagination, encourages us to join him and to say it as it is. We clergy often know the words of religion but miss the music. William Mills calls us back to the vocation of trying to tune our lives to the harmonies of the eternal but only by recognizing emotional and factual truth and in pursuit of justice. Enjoy it and feel yourself defrost."" --Mark Oakley, Dean, St. John's College, Cambridge ""Losing My Religion is the brave, tender, furious account of how William Mills is lifted, brought low, broken, healed, and made whole. As books about religious life go, it is among the wisest and most honest I've ever read. This book should keep company on your shelf with the better works of J.F. Powers, Larry Woiwode, and Thomas Merton."" --Kyle Minor, author of Praying Drunk: Stories ""This book should be required reading for every seminarian of every confessional tradition, not as a warning, but as an invitation to assume with loving faithfulness the awesome task of ministry."" --John Breck, Retired Professor of New Testament and Ethics, Saint Vladimir's Orthodox Theological Seminary ""Mills' honest journey from disorientation back to hope will inspire all who read this wonderfully rendered memoir."" --Scott Hoezee, director, the Center for Excellence in Preaching, Calvin Theological Seminary ""For the clergy as well as the congregation, William Mills' memoir of parish ministry chronicles with refreshing honesty and insight the three-part journey from childhood to or.